An Ancient Solar System...: Answers for Authors: What if the biggest NEO was going to hit us? Answers for Authors: What if the biggest NEO was going to hit us? One use I put my physicist training to is answering questions sci-fi authors. I mean, the PhD has to be useful for something, right? "What if the biggest NEO was going to hit us, and we only found out 16 months before impact?" The biggest Near Earth Object is a 30km wide iron and stone asteroid by the name of 1036 Ganymed. That’s 125 times bigger by volume than the dinosaur killer, so we’re all in for really bad day if it hits Earth. Although only quite briefly, as the blast would actually boil oceans. "Dammit to hell John, why do you keep sending me weird lists about stuff?" Ideally you'd want to scout it with an unmanned, like the NEAR probe. But time is very short, so world wide scutiny using the biggest telescopes and radar dishes will have to do. We actually already know 1036 Ganymed pretty well. It’s an S-type asteroid, composed of stone, iron, and possible certain amounts of other metals. It has an elliptical orbit that ranges from just outside Earth's to between Mars and Jupiter, and isvinclined at quite a high (26 degrees) angle to Earth’s. We don’t know if it’s a rubble pile or a solid rock, so we need to be careful how much force we use - giving any part of the asteroid more velocity than it’s escape velocity (which is estimated at about 19 meters/sec) risks shattering it, and turning one dangerous object into many without altering their overall course. NASA’s most realistic option for diverting an object greater than 500 meters across, with a short prep time, is good old nuclear weapons. Why? They pack a punch, they’re a well understood technology, and we have plenty of them. Bombs could be launched to intercept the asteroid, using heavy-lift rockets like the Atlas V, or NASA’s SLS booster. Set off with a proximity fuse, they wouldn’t need to land or match speeds with the target - just get close and go off. Above: The 'hot-rod', a miniaturised prototype of the Orion launcher. So we’ll have to take their conclusions about moving smaller asteroids, and scale things up in as reasonable a way as we can. 4: How much do we need to move it? To change Ganymed’s course we need to change its speed. How much by? This is kind of a ‘how long is a piece of string‘ question, as Ganymed has been diverted onto a fictional orbit. But we can try and come up with some ball park figures, and get a rough idea – something plausible. Luckily for us there’s a very convenient simulator run by NASA/JPL, where you can see what various pushes and pulls on an Earth impacting asteroid would do. Here’s the link to the simulator. It only gives us the option of a few pre-loaded Earth impacting asteroid orbits to play with, none of which exactly matches the orbital parameters for Ganymed. But, since we’ve altered Ganymed’s orbit, an orbit that is close to Ganymed’s and hits Earth will do – and there is one like that (Sim8 on the menu, which has similar orbital period, semi-major axis, and eccentricity). If you’d like to have a go yourself here’s a link to Ganymed’s orbital parameters. In general the earlier you can get the shove in, the better. If we could get there about 1500 days before impact we’d need to change Ganymed’s velocity by 1cm per second (against its direction of motion), to get it to miss Earth. Catch it an orbit earlier and that number drops to 0.4 cm/sec, and two orbits earlier gives us 0.3 cm/sec. Someone with a better grasp of orbital mechanics than me might be able to get the 6-month scenario down to 20cm/sec. But I’ll be genuinely surprised if someone can budge Ganymed enough with 1cm/sec delta V so close to Earth (don’t let that stop you trying though, being wrong teaches me more!). That doesn’t sound so bad, does it? 40 cm/sec is a granny’s shuffle. Granny, however, doesn’t weigh over a trillion tons. Not even a really big granny. 5: How much we actually can change Ganymed’s velocity, using nukes? ...The high efficiency of the deposition and relatively deep penetration of neutrons reduce the necessary neutron yield to near 100 kilotons of TNT-equivalent.... To understand the action of a standoff nuclear explosion, and its ΔV capability, a member of the Mitigation Panel (David S.P. Dearborn, Lawrence Livermore National Laboratory) simulated the effect of a nuclear standoff detonation on homogeneous 1-kilometer-diameter NEOs with densities between 1.91 and 1.31 g/cm3. In these numerical models of a standoff burst about 150 meters above the NEO’s surface, about 40 seconds after the burst the NEO’s speed change ranged from 2.2 to 2.4 cm/s..... The minimum speed change for a highly porous NEO is controlled by the amount of totally vaporized material. In these models this minimum ΔV is about 0.8 cm/s for an explosion with a strong neutron output. So for 1 km diameter object a 100 kiloton nuke, detonated at a range of 150 meters, will change its speed by 2.2 to 2.4 cm/sec. Ganymed has roughly 39000 times the mass of a 1km asteroid, so to get the same 2.4cm/sec change in velocity, we need around 39,000 100kt nukes! And, if it's a porous rubble pile, even that only gives us 0.8 cm/sec. 6: Start to panic and look for a really huge bomb. We badly need to up the ante: Let’s build and field copies of the Soviet ‘Tsar Bomba’- the biggest nuke ever detonated, and use its never tested 100 megaton configuration. 100kt = 100,000 tons TNT equivalent, 100MT = 100,000,000 tons TNT equivalent, so the Tsar Bomba is 1000 times more powerful than the bomb in the initial calculation. Let’s assume that, using the right positioning above the asteroids surface, we get roughly 1000 times the thrust from that 1000 times bigger bang***. So, if Ganymed is solid, we need 39 Tsar Bomba’s to get 2.4 cm/sec velocity change. If Ganymed is a huge rubble pile we need 39 Tsar-Bomba’s to get a 0.8 cm/sec velocity change. 7: How do we get the really huge bombs out there? Earth finds out about the impact 16 months prior. We now know from the NASA simulation that how many bombs we need will rest on how fast we can get them out there. There’s zero chance we can reach Ganymed in time using normal missiles – they’re not at all designed for interplanetary flight. Tsar Bomba was a cylinder 2 meters wide, 8 meters tall, and weighing 27 metric tons. Using the most powerful rocket likely to be available in the near future (The American SLS launcher, which is still being developed), how soon can we get bombs out there? I could attempt the maths, but I’m … efficient. I'm lazy, and the simulator has an ‘intercept mode’ that will tell you how much it mass a given type of heavy lift rocket can get to the asteroid, how many days before impact, and how far in advance we need to launch. 49.4 / 0.8 = 61.75. 61.75 times 39 is 2408. So that's 2408 bombs and rockets! Even if Ganymed is solid…..
20.6 times 39 is 802.75 of them! 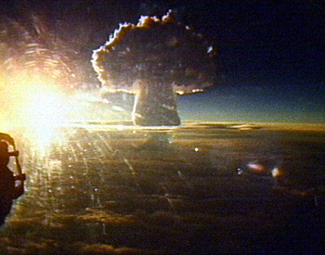 Above: The detonation of Tsar Bomba. Imagine the power of hundreds of them. We’ll need at least 800 Tsar Bombas, on 800 SLS (or some equivalent) boosters. Can we up the bang level? Edward Teller proposed a 10 gigaton bomb (10,000,000,000 tons of TNT equivalent). That’s 100 times stronger than the Tsar Bomba. But there’s an upper limit on energy density, even for nuclear fuel, so a 1.3 gigaton device would weigh about 250 tons – and a 10 gigaton one would easily top 1000 tons. We’d still need several, maybe dozens of them. Now, as I said above: Someone who calculates rocket trajectories for a living might well know tricks I don't, do some better maths, and be able to cut those numbers by a half, by three quarters even. That still means we need hundreds of the biggest bombs ever designed. A 5km body would be plenty devastating if it hit, and only weigh 125 times more than the 1km wide impactor in the simulation 'Defending Planet Earth: Near-Earth-Object Surveys and Hazard Mitigation Strategies'. In the story the world has just undergone a period of tension and arms race. It is that much more powerful launchers have been developed, to field incredibly powerful bombs like these – that might tie in with the Mars mission happening in the story. There are designs for huge space launchers: The Orion drive we mentioned earlier, a system propelled by throwing small nukes out the back and setting them off, could have easily lifted 5000 tons. That’s plenty of room for a super nuke, and Orion could get it out there incredibly fast as well – it’s so powerful the kind of orbital mechanics the simulation employed here could be ignored. Another really huge (though not so huge as Orion) launcher is in the works: SpaceX's Big F***ing Rocket. Yes that's it's real name. It's launch capacity hasn't been released yet, so we can't do any calculations for it, but is likely to be 2-3 times that of SLS - and the engines are already being tested by SpaceX. In the end the author came up with their own (frankly brilliant) plot workaround. I really do enjoy helping writers by setting up and solving problems like this. Although I stll have to wait for the book to come out to discover whether humanity gets saved. * Just to be clear: Don't try to save mankind with these figures - they were just to give the guy something ballpark realistic to work with! **Aside from ‘we all scream and die’? ** Why assume that? Well, a nuke in space as no shockwave, it’s just a huge flash of radiation. We still need to not shatter the asteroid, so we need to change the distance of the detonation to keep the radiant energy per square meter at the asteroids surface the same. That’s easy enough: Radiant intensity changes with the square of the distance to source, so now we have a bomb 1000 times stronger we need to increase the standoff distance by the square root of 1000, or roughly 31.6 times. The original distance was 150 meters. 0.150 times root 1000 equals about 4.75. So 4.75 km is our new standoff distance. Our distance from surface to source has increased by (root1000), so the surface area that is exposed to any given flux of radiation (ie, enough to vaporise rock and produce propulsion) has increased by (root1000) * (root1000) = 1000. So we have roughly 1000 times the surface area receiving the same radiant intensity as we had for the 100kt bomb calculations, and hence 1000 times the vaporising material and 1000 times the thrust. There’s the question of ‘does more of the bombs radiation miss the asteroid at the new standoff distance?’ 4.75km divided by 34km = 0.14. 0.15km divided by 1km = 0.15, so the proportional distance from bomb to target, an hence the proportional amount of radiation lost, is about the same. Nuclear Weapon Archive, B41 Bomb. Starship drives part 2: Faster than light engines! Asteroid 2002 AA29: Half-way a moon, entirely enigmatic. SpaceIL lands on the Moon... really, really hard.... ... but well done to them anyway! The Universe in 101 words: How was the Sun born?